Graff-Pinkert has several excellent ACME GRIDLEY 1-5/8" RBN-8 machines in stock. The ACME 1-5/8" RBN-8 was the latest design ACME GRIDLEY produced for that size diameter. The machine's frame is the same as that of an ACME 1-1/4" RB-8 making it smaller than its predecessor model, the ACME 1-5/8" RB-8. It has a significantly quicker indexing time than the 1-5/8" RB-8, making it the preferred 8-spindle screw machine for many ACME shops. 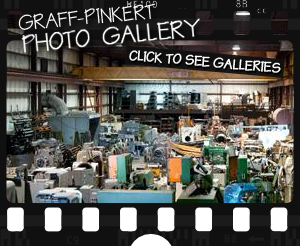 Graff-Pinkert sells ACME GRIDLEY 1-5/8" RBN-8 machines refurbished or in as-is condition. Rotary transfer machines are ideal for even larger quantities and more complicated parts than those produced on multi-spindles. Rotary transfer machines are used to produce turned parts which require many operations such as cross drilling, cross tapping, milling, and extensive back-working. The machines normally are used to produce volumes in the millions annually. Some of the most popular rotary transfer machines worldwide include Hydromat, Eubama, Micron, and Buffoli.